OK, yes, I’m late getting this done this week – things have been busy… but better late than never! This week, Venus is reappearing in our night skies! It will be a while yet before it’s making a significant showing as the “Evening Star”, but it is there! If you have a clear western horizon, you can see Venus emerge out of the Sun’s glare just after sunset. Slowly, steadily, Venus will be climbing higher each night, but we (Earthlings) and Venus are on opposite sides of the Sun, and we’re running away from Venus, trying to keep the Sun between us. Since Venus moves quicker, it’s catching up and moving out from behind the Sun – but it won’t happen quickly. Because Venus occupies an orbit between us and the Sun, it exhibits phases, like the Moon, enabling us at times to see a crescent planet. For now, though, the Sun sits between us, and Venus is full. Venus is an interesting planet. A rocky planet very close in size to Earth (81.5% of Earth’s mass), it orbits the Sun every 225 Earth days – but this amounts to only .93 Venusian days. The planet rotates more slowly than any other planet, and its day actually lasts longer than a year. It also rotates “backwards” (clockwise, as viewed from the north pole), so that on Venus the Sun, on those rare occasions when it does rise, rises in the west. Up close, Venus is a hellscape. With surface temperatures averaging over 860 degrees F (460 deg C), pressures about 90 times higher than on Earth, and clouds of sulfuric acid, it’s an extremely harsh place. Mankind’s first interplanetary landing took place on Venus (a Soviet probe named Venera 7, in 1970) and lasted only 23 minutes before succumbing to the extreme pressure and heat. From our vantage point, Venus is the brightest object (besides the Sun and Moon) in the sky, and is a thing of beauty, appropriately bearing the name of the Roman god of love. BUT, not all civilizations have seen it this way, and some have embraced the more “hellish” interpretation of this world. In particular, the Aztecs saw the planet Venus as the embodiment of two different deities. The morning star, Tlahuizcalpantecuhtli (Tla-wheez-cal-pan-tuh-COOT-li), is the malevolent embodiment of the great winged serpent, Quetzalcoatl (Ket-zel-co-AH-tl). He is a symbol and bringer of death, wielding darts to strike down innocent people. Aztec people would be careful to close their houses tightly when Tlahuizcalpantecuhtli was in the morning sky, lest light from the planet bring death, and sacrifices (humans and otherwise) would be made in ritual attempts to appease the “Lord of the Dawn”. Thankfully, that particular deity is not in our skies these days. Instead, we’re seeing the evening star, or Xolotl (Show-LOW-tl). 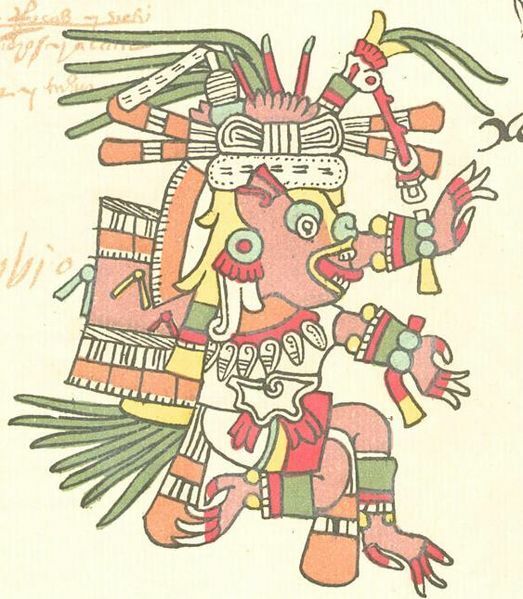 Still powerful, Xolotl is portrayed as a dog, the twin of Quetzalcoatl, and a god of fire and lightning, as well as death – but in a less “kill you with darts of light” kind of way. Xolotl is responsible for shepherding the Sun’s nightly journey through the underworld, keeping it safe. When we see Xolotl in the evening sky, he is merely trailing the Sun, doing his guard duty. 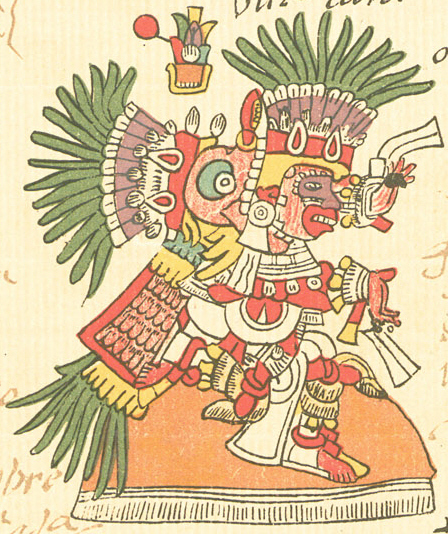 Interestingly, Aztec astronomers were very aware that the morning star, Tlahuizcalpantecuhtli, and evening star, Xolotl, were the same body (though they didn’t necessarily recognize it as an Earth-like planet), and developed the ability to very precisely predict its position for a given time. Traditionally, though, the predawn planet was definitely more malicious than the evening one. This makes sense to me – as a definitely-not-a-morning-person person, I’m much happier to see Venus… uh, Xolotl… after sunset than pre-dawn. Go Venus! Hurry up and rise. Particularly this time of year. There’s something nostalgic for me about Venus shining high in the sunset of a warm spring/ summer evening.